According to projections of the continuing educational volume with regard to the population between the ages of 19 and 64, the Adult Education Survey (AES) quotes 1,700 million hours spent in continuing educational programmes. In 1994, the volume of continuing covered 2,790 million hours, 1991 2,750 million hours. After the decline of vocational continuing education in the comparison of 1991 (1,650 million hours) and 1994 (1,570 million hours), 1997 had the most hours (1,950 million hours) so far. The development (see table) has a declining tendency again: 1,660 million hours in 2000 and 1,240 million hours in 2003. 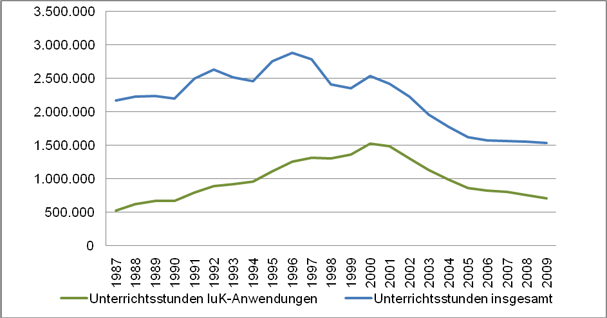 The withdrawal of continuing education measures supported by the Social Code, is a possible reason for the decline between 2000 and 2003. In comparison to vocational continuing education, the volume of general continuing education increased between 1991 (555 million hours) and 1994 (590 million hours). In the surveys between 1997 and 2003, only hours spent in formally organized vocational training was considered. Note. : For 1991 and 1994, the additional volume of „resumed training“ was recorded separately. The number of programmes and the lessons conducted within are relevant data for depicting the programme development. The programme development though is inconsistent in adult education centres. The number of programmes – including open access courses as well as contractual courses – increase continuously between 1998 and 2004 to 560,000 courses, reach a low in 2005 (547,000) and range presently at 569,000 courses. The number of lessons was in decline as of 2003 and has increased continuously since 2005. At present, the number of programmes has reached a new peak level: the number of lessons exceeds the level of 2003, but not the all time peak level (15,291 in 2002). 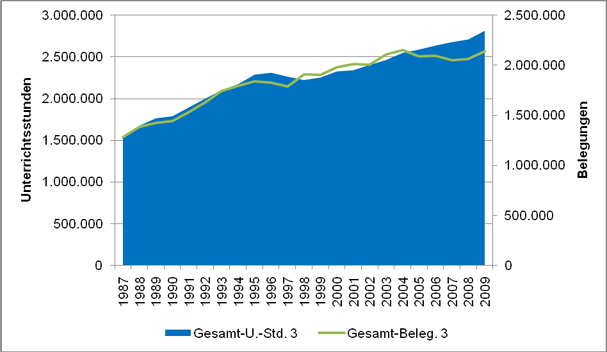 The “Network Statistics on Continuing Education“ combines the Association of German Educational Organisations (Arbeitskreis deutscher Bildungsstätten - AdB), der Bundesarbeitskreis Arbeit und Leben (BAK AL), die Deutsche Evangelische Arbeitsgemeinschaft für Erwachsenenbildung (DEAE) and the Catholic Federal Organisation of Adult Education (Katholische Bundesarbeitsgemeinschaft für Erwachsenenbildung - KBE). In 2008, the institutions‘ programmes covered 453,000 courses, seminars, training courses, events, field excursion and educational journeys as well as lectures and other shortened forms offered in 6.8 million lessons. After the positive development in the previous year, a decrease of events is contrasted by a increase of lessons. The Adult Education Survey (AES) 2007 provides data on the context of adult education programmes. 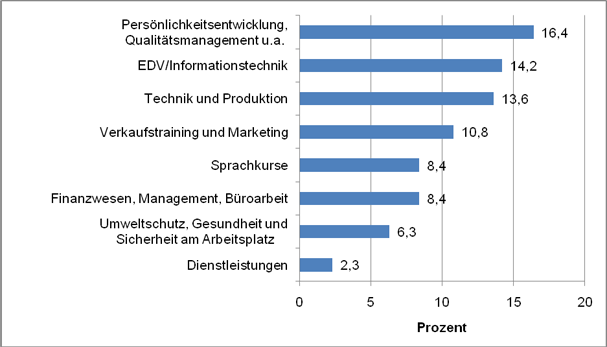 The category “use of computers/software“ is most prevalent in non-formal educational programmes, followed by the topics “commerce, marketing, accounting“ and “health, nursing, medical services“. The distinction of non-formal education depicts the following image: the topic „computer“ has the same priority in all three forms of continuing education; as well as „health, nursing, medical services“. “Art, music, media” as well as “languages, literature, history, philosophy” are important in non-professional continuing education but not in vocational training. “Work and organization” are only important in vocational training. 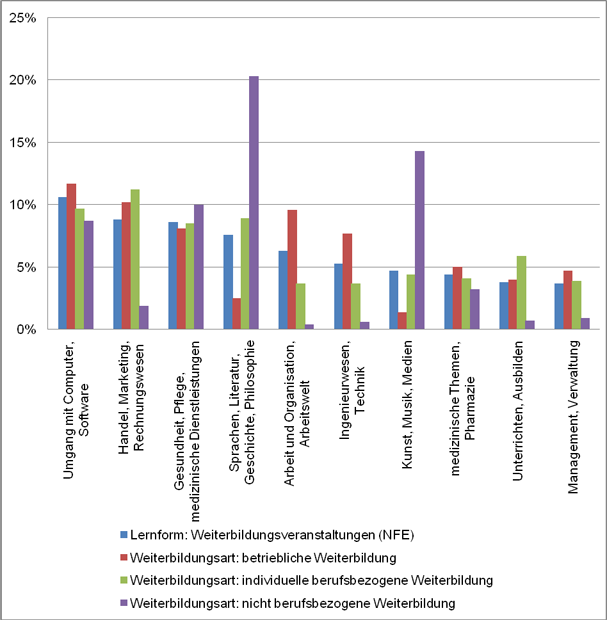 The Reporting System on Continuing Education (Berichtssystem Weiterbildung - BSW) provides data on the development of central topics in training courses, courses or lectures attended by working population in the year previous to the survey. 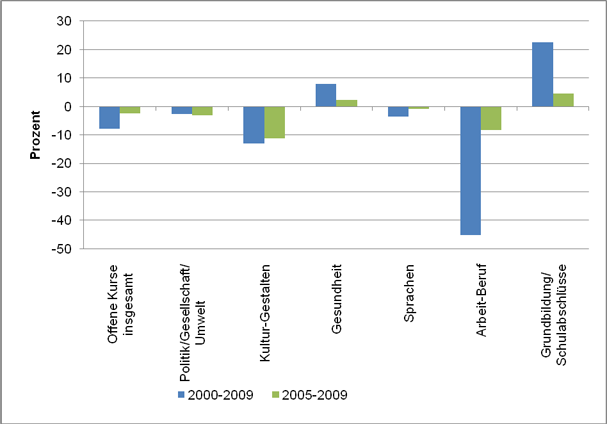 Slight change of the particiption rate Iare noticeable over the years but no serious changes of preferences of topics. 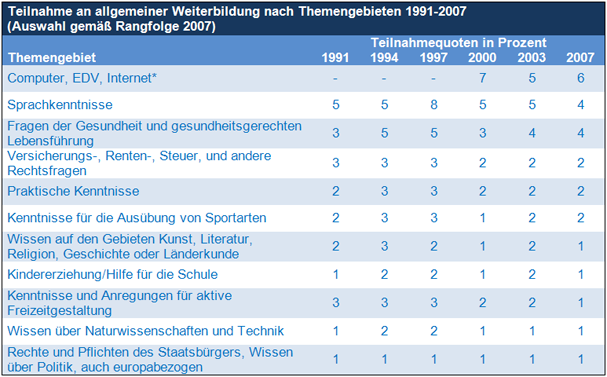 In the survey year 2007, the topics “Computer, IT, Internet“, “Language Skills” and “Health” were most relevant. Six respectively four percent of all interviewees attended an event regarding one of these topics. A constantly low of only one percent of all participants attended programmes in “Civil Rights and Responsibilities, Political Know-How“. Overall, the participation rate in general continuing education increased from 22 percent to 31 percent between 1991 and 1997. During the following two survey years, the participation rate decreased to 26 percent. In the survey year of 2007, a slight upward tendency showed a participation rate of 27 percent (see v. Rosenbladt/Bilger 2008, p. 40). Note. :* This category was first surveyed in 2000. Previously, this category was part of „Other Topics“. The national survey of wbmonitor 2010 provides data on key topics from the providers‘ perspective. Key topics in vocational continuing education are: management training, self-management and soft skills. 32 percent of all providers focus on these topics, 40 percent offer programmes in this field. Commercial continuing education is also highly significant. 31 percent of all providers focus on this field respectively offer programmes. Vocational IT skills are also significant for providers of continuing education. More than 50 percent of all providers offer programmes in this area, whereas 26 percent put their main focus on this topic. “Basic IT”, “Languages and Intercultural Competences” as well as “Health, Wellness” are most significant for providers of general continuing education. Quantitative topical development offered in open programmes at adult education centres: In relation to percentage of lessons in all open programmes in 2009, languages covered the biggest area with 42 percent, followed by health (19 percent) and work/profession (15 percent). Basic education/school leaving certificates as well as culture/design range at 10 percent; politics/society/environment at 5 percent. 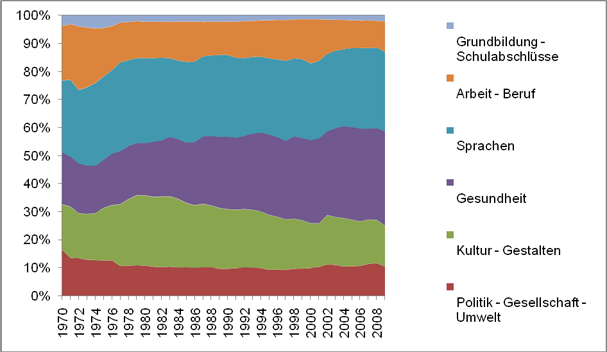 Between 1970 and 2009, the topics of language and health increased, politics/society, environment as well as culture/design decreased. The percentage of lessons in the other areas varies – work/profession between15 and 22 percent and basic education/school leaving certificates between 7 and 11 percent. The increase of the total annual lesson volume between 1970 and 2009 has to be taken into account for data interpretation: from 2.8 million in 1970 to 15.3 million in 2009. Table xy shows the development of total lessons in open programmes for the individual programme areas. Participation in open programmes at adult education centres divided into six programme areas shows the different significance of the individual thematic areas and their changing significance. In the area of “Health“ – at present the biggest area – participation was continuously increased from 18 percent in 1970 to 34 percent in 2009. It passed “Languages” as the most important programme area in the mid 1990s. Participation in the second largest area “Languages” is continuously on a high level with fluctuations between 26 and 32 percent. The significance of “Culture/Design” increased until the mid 1980s (all time peak at 25 percent between 1979 and 1984) and continuously decreased after to 15 percent in 2009. Initially, 20 percent of all participants attended programmes in the field of “Work/Profession”; after a temporary high in the late 1990s, only 11 percent participation is registered at present. “Politics/Society/Environment“ declined from 17 percent in the mid 1990s to 9 percent; it has now reached a steady 10 percent. 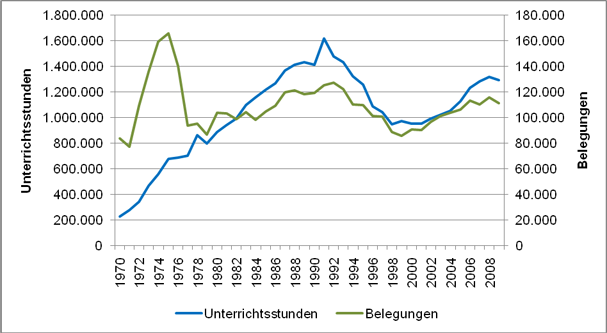 Participation in „Basic Education/School Leaving Certificates“ decreases slowly but continuously until 2000, then increase to 2 percent in 2009. The large increase of participation between 1970 and 2009 (2.2. million in 1970 to 6.4. million in 2009) has to be taken into account. Table xy shows the development of total lessons in open programmes for the individual programme areas. Table 6 shows the marked differences in increase and decrease of lessons in open classes at adult education centres in the ten year period of 2000-2009 respectively a 5 year period of 2005-2009. Starting in 2000, the growth rate is a total of 2 percent in the following 10 years; 6 percent for the 5 year period after 2005. Increasing participation is noticeable for “Health“ (10 years: +21 percent; 5 years: +9 percent), “Languages“ (10 years: +14 percent; 5 years: +9 percent) and “Basic Education/School Leaving Certificates“ (10 years: +36 percent; 5 years: +15 percent). 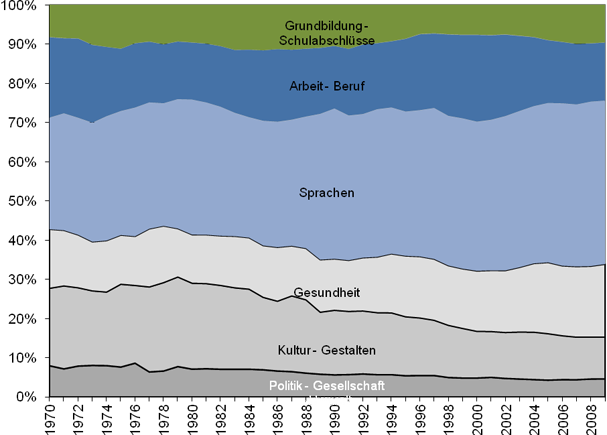 Decreasing areas are “Culture/Design“ (10 years: -11 percent; 5 years: -5 percent) and “Work/Profession“ (10 years: -39 percent; 5 years: -5 percent). The field of “Politics/Society/Environment” decreases by 9 percent after 2000 and increases 10 percent after 2005. Table 4 shows the proportional development of the individual programme areas over a longer period of time. The table shows the increase and decrease of participation in open classes at adult education centres. Over the last 10 years, participation in open classes shows a negative trend: at present a decrease of 2 percent is noticeable in the 5 year period 2005-2009 – a decrease of 8 percent in comparison to 2000. A decrease is noted in the area “Politics/Society/Environment“ (10 years: -3 %; 5 years: -3 %), “Culture/Design“ (10 years: -13 %; 5 years: -11 %), “Languages“ (10 years: -4 %; 5 years: -1 year) and particularly in the area “Work/Profession” (10 years: -45 %; 5 years: -8 %). An increase is noted in the programme areas “Health” (10 years: +8 %; 5 years: +2 %) and “Basic Education/School Leaving Certificates“ (10 years: +22 %; 5 years: +5 %). Table 5 shows the proportional development of participation in the various programme areas over a longer period of time. The graph shows the thematic profile of institutions involved in the Network Statistics on Continuing Education listed by proportion of lesson in various topic areas. The individual proportion of lessons was generally stable between 2002 and 2008 without a shift of significance in topic areas. Topic areas comply generally with programme areas covered in Statisitcs on Adult Education Centres; the Network Statistics divide the area used in adult education centres of „Politics/Society/Environment“ into three topics: Politics/Society, Family/Gender/Generation and Religion/Ethics based on the provider’s thematic focus. “Family/Gender/Generation” is the thematic focus of the continuing educational programme. Between 32 and 36 percent of all lessons cover this thematic area. “Culture/Design” covers 13 percent of all lessons, “Health” 12 percent, “Work/Profession” 11 percent. “Religion/Ethics” as well as “Politics/Society” cover 9 percent each; “Languages“ (6 percent) and “Basic Education/School Leaving Certificates“ (5 percent) are rather small topical areas. “Environment” is the smallest topical area and covers only 1 percent of all lessons. Note: Data is based on projections specific to network. Participation of institutions differs according to association and varies over time. For more information see Weiß/Horn 2010, p. 11. The promotional and adaptation education provided by the Chamber of Industry and Commerce focuses mainly on the commercial and industrial-technical sector. Following a decreasing tendency in commercial training courses after 2005, this sector has continuously increased in 2009. After increasing continuously between 2005 and 2008, the industrial-technical sector has reached the 2007 level after a decrease in 2009. Continuing education in “IT and Media” as well as training courses in „Trainer Aptitude Ordinance (AEVO)“ are cover a rather insignificant 5 percent with only small variations. The lessons in cross-cutting topics have covered a rather stable 12 percent since 2005. 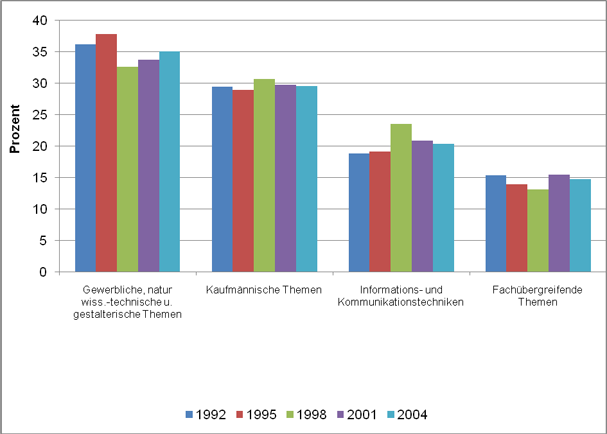 Surveys by the Cologne Institute for Economic Research (IW) between 1992 and 2004 cover the contents of vocational training and show the proportional development of the total lesson volume. In the surveys, vocational training includes formal measures such as training courses, other courses, seminars and informal measures such as training on the job, information meetings and computer supported learning, which are – directly or indirectly - partially or completely funded by companies. The relation of topics has barely changed during the period; the proportion of lessons in total has only varied slightly. 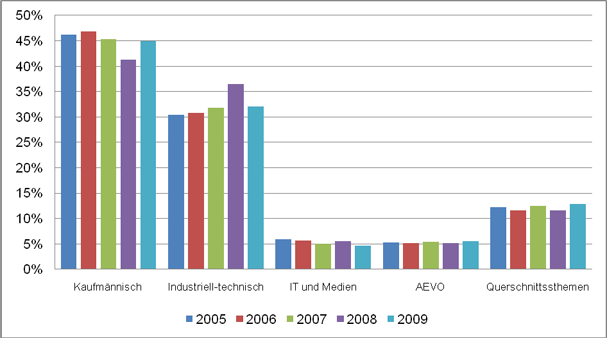 “Business, Scientific-Technical and Creative Topics“ covered the largest percentage (35 %) in 2004. Business, scientific-technical and creative topics have the largest share of the lesson volume in 2004 (35%), followed by commercial topics (30%). Information and communication technology covers 20 percent, interdisciplinary topics 15 percent of lesson volume. Data on nature and extent of vocational training is gathered within the Continuing Vocational Training Survey (CVTS).These surveys cover vocational training, other courses and seminars as well as informal measures such as information meetings, work-related qualification forms and self-directed learning, which is – directly or indirectly – partially or completely funded by companies. In proportion to lessons and participation, the programme area „Languages“ traditionally covers the largest topic area at adult education centres. 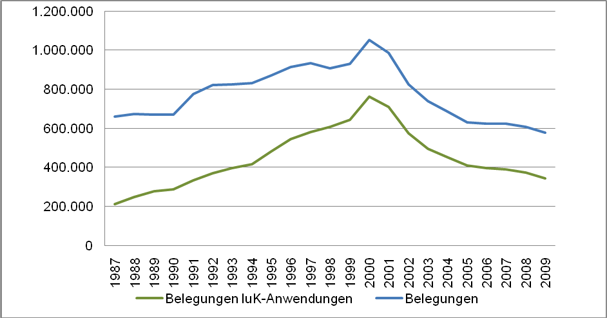 The total number of lessons in open language classes increased from 4 million to 6 million between 1987 and 2009 – an increase of 56 % with only one set back of 7 % in 1998. In 2005, the level of 1997 was reached again. Participation increased less significantly than the number of lessons in the period of 1987-2009: participation increased by 16% - from 1.5 million in 1987 to 1.8 million in 2009. The number of lessons in open language classes at adult education centres is increasing: plus 41 percent between 1988 and 2009, plus 9 percent 2009 in comparison to 2005. 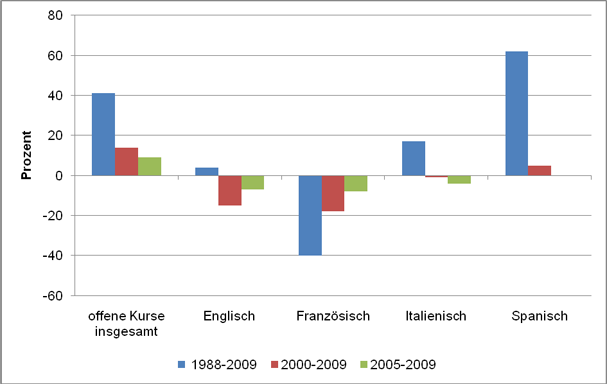 The overall development of the most important foreign languages based on the lesson total reveals a differentiated picture: The lesson total in open classes between 1988 and 2009 increased by 4% in English, 17% in Italian and 62% in Spanisch classes. French classes decreased by 40%. Between 2005 an 2009, English and Italian also decreased: 7% in English and 4% in Italian. Spanish classes remained stable. Table 14 shows the increase of lessons and participation in less popular foreign languages at adult education centres. Participation and lessons increased the most in Norwegian and Modern Hebrew – supply and demand for these languages increased by around 30% between 2005 and 2009. A large gap is noted between demand and offered programmes for Chinese. Whereas the lesson total increased by 20%, participation only increased by 1%. The lesson total also exceeds the increase of participation in Danish, Swedish and Dutch. For Japanese, the increase of demand is greater than the supply. With regard to lessons and participation, the programme area „Health“ is becoming more significant at adult education centres, both based on absolute numbers as well in relation to other programme areas. Supply and demand are increasing – 67% from 1.2 million in 1987 to 2.2 million now. Lesson total increased by 83% from 1.5 million to 2.8 million in 2009. Since 2005, lessons in the programme area „Health“ have increased by 9 percent, participation by 2%. The largest proportion is noticeable in the topics Gymnastic/Exercise/Body Experience (2009: 45,6% of lessons; increase: 1987 – 2009: 120%) and Autogenic Training/Yoga/Relaxation (2009: 31,1% of lessons; increase 1987 – 2009: 130%). The table shows a great difference of increase and decrease of lessons and participation in open classes at adult education centres in the programme area “Health“ between 2005 and 2009. The demand for continuing education in the field of “Health Care/First Aid/Nursing”, “Autogenic Training/Yoga/Relaxation” as well as “Nutrition” increases, whereas the demand for “Health Care Policy/Health Service” and “Diseases/Curative Treatment” decreases. Based on the initial number of lessons, the topic area “Autogenic Training/Yoga/Relaxation” increases the most by 18%, “Health Care/First Aid/Nursing” by 7%. “Health Care Policy/Health Service” decreases by 16% in lessons, “Diseases/Curative Treatment“ by 29%. 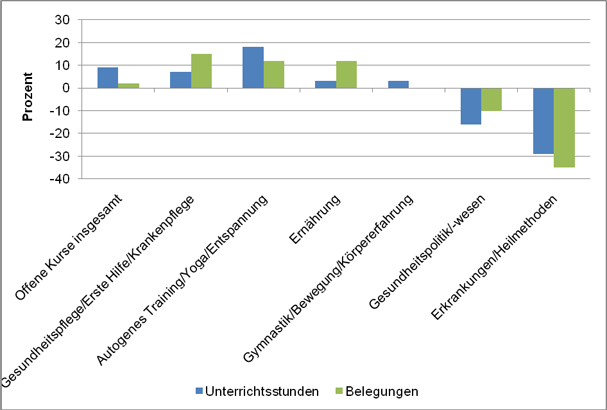 Over all, the programme area „Health“ at adult education centres is dominated by the subjects „Gymnastics/Exercise/Body Experience (2009: 45,6% of lesson total) and Autogenic Training/Yoga/Relaxation (2009: 31,1% of lesson total). The year 2000 marked a turning point in the programme area “Employment/Work“ at adult education centres. Lessons increased between 1987 and 2000 by 16% to 2.5 million lessons. After 2001, they declined by 36% to 1.5 million lessons in 2009. This development is particularly evident in programmes in Informations and Communication Technology (luK). Lessons held in luK programmes increased between 1987 and 2000 by 190% to 1.5 million. 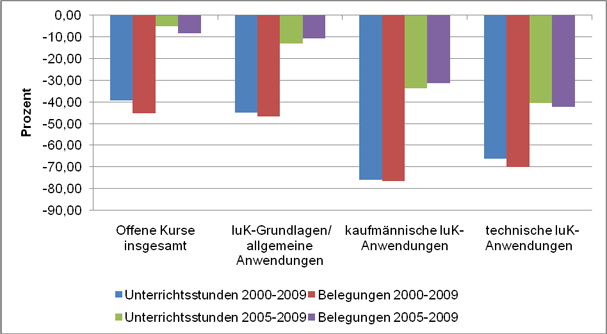 After 2000, the programme area faced a constant decrease – lessons decreased by 52% to 700.000 in 2009. The declining offer of the past years indicates a weakened demand of the subject also suggested by the development of enrollment in programmes in the area „Employment/Work“ at adult education centres (see table 18). The development of participation in the programme area „Employment/Work“ at adult education centres reflects the development of the range of programmes on this topic (see table 17). Witrh regard to open classes, the demand has increased by 60% to more than a million between 1987 and 2000, participation in information and communication technology (luK) even tripled. These increases in the area “Employment/Work“ were followed by steady decreases since 2001: participation decreased by 41% to 578.000 between 2001 and 2009; participation in luK programmes decreased by 52% to 344.000. At adult education centres, a steady downward trend in the development of supply and demand in the field of information and communication technology (luK) has been evident for the last ten years (see table 17 and table 18). Business luK applications are decreasing in particular. Since 2000, the lesson volume of this subject area has decreased by 76%, participation by 77%. Between 2005 and 2009, the decline has slightly slowed down: currently 34% in lesson volume and 31% in participation. Technical luK application have decreased nearly to the same extent over the last ten years: lesson volume has decreased by 66%, participation has decreased even more by 70%. Since 2005, the decline has also slowed down in this area: 41% in lessons, 42% in participation. Supply and demand of luk basics/general applications also decreased. Over the past ten years since 2000, the lesson volume has decreased by 45%, participation by 46%. Here as well, the decline has slowed down since 2005 to 5% respectively 8% in participation. Between 1970 and 1991, the lesson volume in the programme area “Basic Education/School Leaving Certifications” at adult education centres increased by 600% to 1.6 million. The volume declined to less than a million until 1998, similar to the level in the early 1980s. The volume of lessons increased again between 2002 and 2008 to 1.3 million, and decreased since 2009 by 2%. 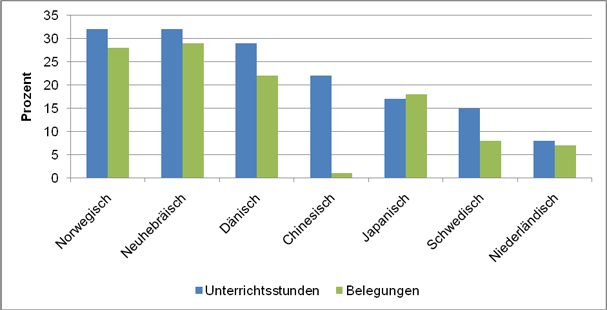 The subjects with the largest lesson volume are: Realschulabschluss – German school leaving certificate attesting an intermediate level of secondary education (2009: 26.2% of lessons), Hauptschulabschluss – German school leaving certificate attesting a lower level of secondary education (2009: 21.7% of lessons) and literacy/elementary education (2009: 17,6% of lessons, see table below). These subjects contributed strongly to the increase in the past ten years. 1975, the programme area reached its peak level with 166.000 registrations; the lowest level was reached in 1999 with 86.000 registrations. 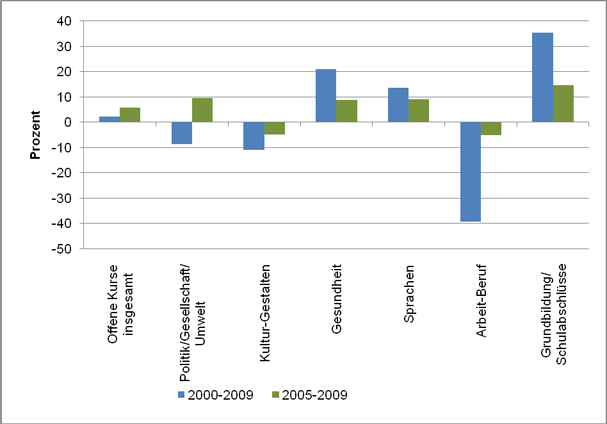 Between 2000 and 2009, participation increased again by 23% to currently 111.000. Despite the outstanding increase of supply and demand over the past ten years (see table 6 and 7), the programme area „Basic Education/Scholl Leaving Certifications“ plays a rather insignificant role in based on lessons and participation. 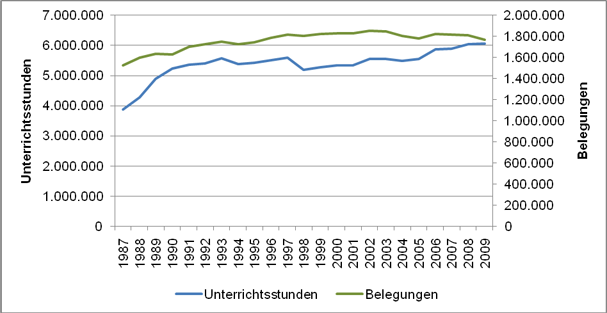 Since 1997, the lesson volume in the programme area „Literacy/Elementary Education“ at adult education centres increased and reached a peak level in 1990 with 348.000. This development was followed by a decline between 1994 and 2000 of 50% 10 112.000. In the following years, after an increase of more than 100% more 228.000 lessons were registered. During the first years after 1977, the development of participation was contrary to the development of lessons. 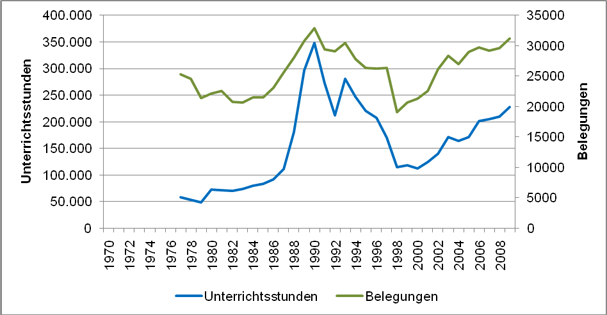 Participation decreased between 1977 and 1983 by 18% to 21.000. In 1990, after a decrease, a peak level was reached with 33.000 registrations. A subsequent decline ended in 1999, the area of “Literacy/Elementary Education” became more significant. In the ten year period after 2000, participation increased by 46%. The UNESCO World Literacy Decade (2003-2012) might have played a role here, in which several literacy programmes were initiated in Germany e.g. the German Adult Education Association (dvv) is part of a national association for literacy. The programme area „Basic Education/School Leaving Certifications“ at adult education centres, particularly the subject „Literacy/Elementary Education“ plays a significant role in terms of educational and socio-political aspects. In the past ten years, supply and demand in this area have increased significantly. In the years after 2000 respectively 2005, the lesson volume increase by 36% respectively 15% in the programme area “Basic Education/School Leaving Certifications“. Lessons in “Literacy/Elementary Education” increased even more in the same period of time: the growth rate in the past ten years was 102%, 33% since 2005. Participation rates increased as well, even though not as much as the lesson volume. In the area “Basic Education/School Leaving Certification“, the growth rate since 2000 was 23%, 5% since 2005 Participation in “Literacy/Elementary Education” increased by 46% since 2000, 8% since 2005.